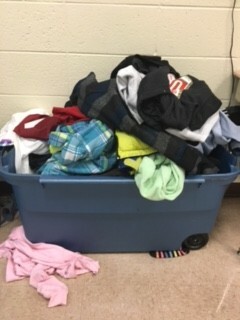 I work as an RTI teacher at Manchester Elementary School. I also am the editor of our school newspaper, The Shiner Times. 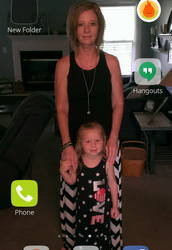 What do you do when you lose your Mom at an early age, and you still need lots of mothering? I had many moms when I was growing up to encourage me and show me the right way to go. They listened to me and shared with me their hearts on matters big and small. Who were all these moms? They were my school teacher Moms and GrandMoms who took the time to care about me like I was one of their own children. We have lots of those kinds of teachers at MES. Read on to learn about their very full lives. and doesn’t give a lick? Even when you are a bear. Teachers Make Great Mothers, and Mothers Make Great Teachers! Mrs. Fisk has been a teacher for five years and a mom for eight months. She says it was very hard at first being a new mom and a teacher because she didn't want to leave Lilah. 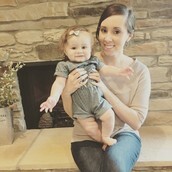 She says they are now into a good routine and she is becoming a better teacher because of this new little life bringing joy to her days and nights. 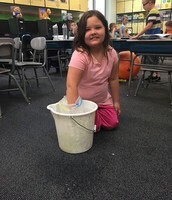 Mrs. Fisk says, "I am becoming more organized as a teacher, because I want to spend every moment I can with Lilah in the evenings instead of doing school work." She says Lilah loves to read stories, play outside, crawl everywhere, and take baths. So does Mrs. Fisk now too! "Suit up, show up, start moving and never quit." Mrs. Teke could be a marathon runner with the amount of energy she puts forth in being a mom and a teacher. All of her four children play major sports in and out of school. 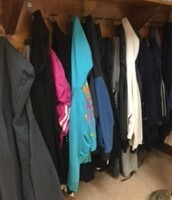 This has helped to make the Teke family very organized and quick on their feet. 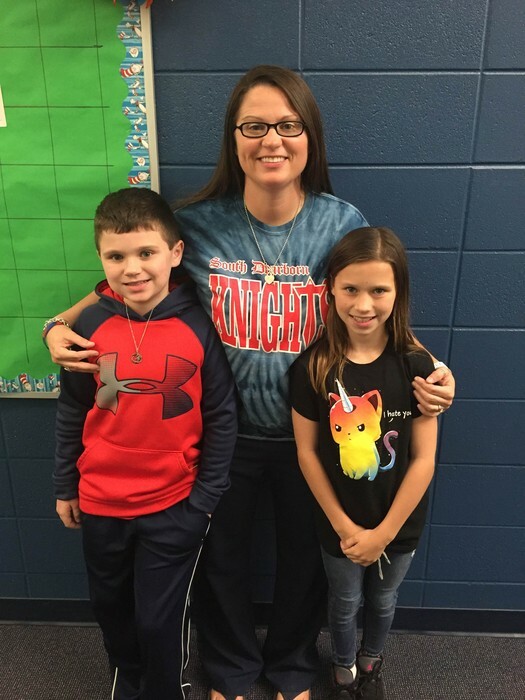 Mrs. Teke says, "I believe being a teacher and a mom go hand and hand. Both have taught me to be patient on most days with all children. Both jobs allow me to find happiness in everyday life." Besides sports, Mrs. Teke likes to spend time with her children playing spoons, Uno, and watching movies together. She says, "I love being a mom and a teacher. They are both very rewarding!" Mrs. Hopper has been teaching at MES for 13 years. She has been able to teach 4th, 6th, and now 3rd graders. 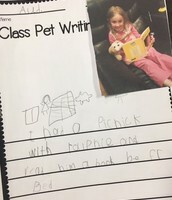 I credit Mrs. Hopper with teaching my son, John Houchens, to be a good writer when she had him in 4th grade. 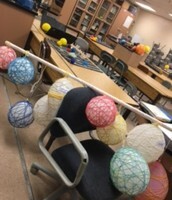 Mrs. Hopper expects her students to be the best they can be and not just get by. She wouldn't let my John wimp out on his writing assignments. With Mrs. Hopper cheering him on, John saw that he could succeed. He is still a great writer to this day. Being a great teacher goes hand in hand with being a wonderful mom. 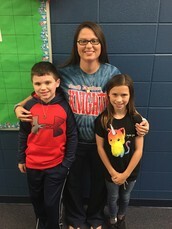 Mrs. Hopper has been delighted to go to school everyday with her children, Olivia and Christopher. 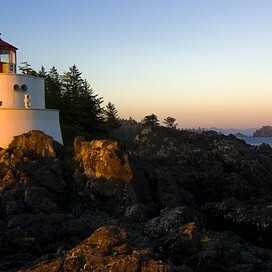 The Hopper family love to go to parks, museums, zoos, hike trails, play games, and watch movies. This was Mrs. Beam's first Mother’s Day! She says: “I love being a mother and a teacher. Being a teacher allows me to spend lots of time with my daughter. 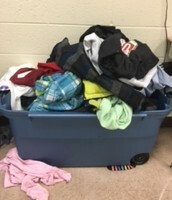 Especially on holidays and summer breaks.” Being a teacher helps Mrs. Beam as a mom, because it helps her realize the things she need to teach her daughter to get her ready for school. Being a mother has also helped her show more compassion and patience towards her students. Mrs. Beam also thinks the job of a mother is as hard as a teacher. It’s too hard to choose which one is the hardest for her! She says; “Sometimes it’s easier being a parent, and sometimes it’s easier being a teacher.” Moms work very hard, and sacrifice for their kids. Did you remember to tell your mom how much you love her? For fifteen years Mrs. Becker has been a teacher, and for twelve years she has been called Mom by her two children, ages 10 and 12. They go to Brookville Schools, and Mrs. Becker has driven a long way to her job over the years. However, she is still totally involved as a mom and as a teacher. 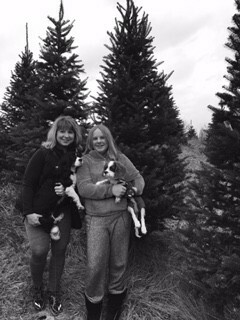 The Beckers are a ball playing family with a busy sports schedule all year 'round. 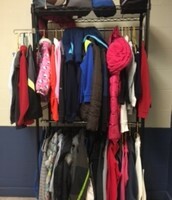 Mrs. Becker says that being a mom has helped her to be more patient and understanding of what parents and students go through to balance homework and extra curricular activities. Being a teacher has kept her in the know of what her own children need to do to succeed in school. It has also made her pretty hip on what is going on in the world, which keeps her children in awe. Its Supermom! She takes off her mask and she’s…….Mrs.Davis!?!?!? Mrs.Davis has been a mother for twelve years, she has one child, and her name is Anna Grace Davis. 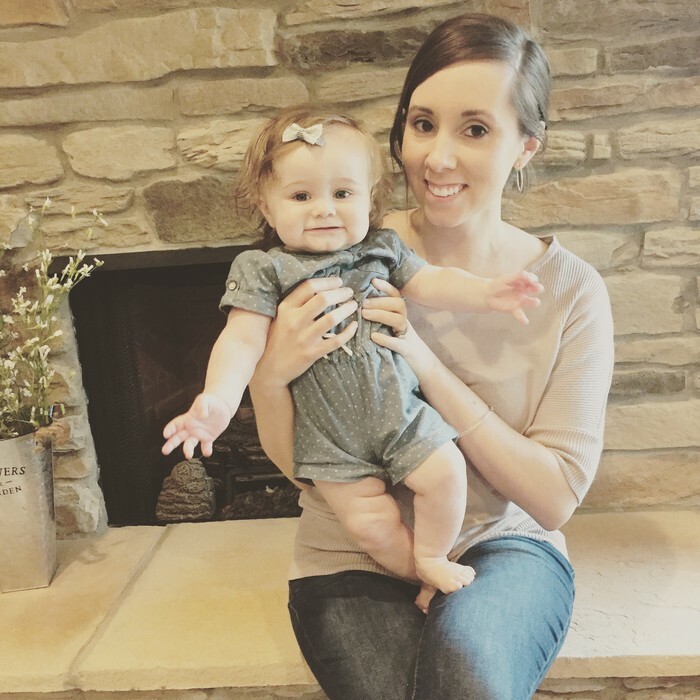 Mrs. Davis says she likes being a mother, but it is challenging. 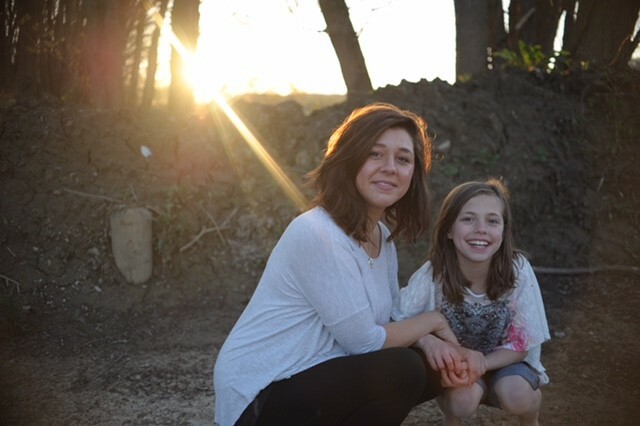 “There are many things I like about being a mother, but my favorite thing is watching my daughter grow up and learn new things.” Mrs. Davis and Grace like to shop, get manis and pedis, and cook together. 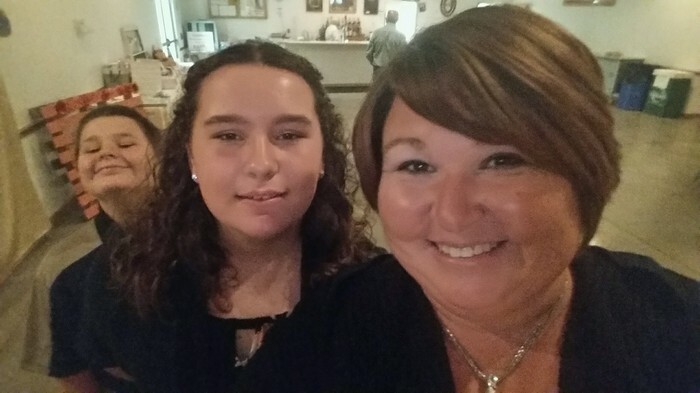 Mrs. Davis says, "Being a mother and a teacher helps my family because I get home the same time as my daughter and can be with her and help her with anything." Children first is the name of the game for Mrs. Selmeyer. 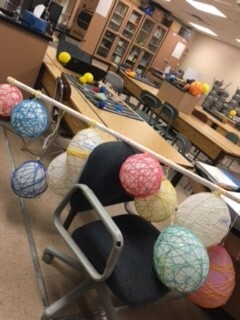 She has been a teacher for 33 years. She was first a mom with a son and a daughter of her own for 39 years. About five years ago, the Selmeyers felt they were supposed to refill their empty nest with three more children, who are in 1st, 6th, and 9th grades. 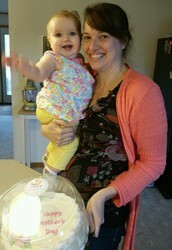 Then to put the icing on the cake, three years ago she became a grandmother. 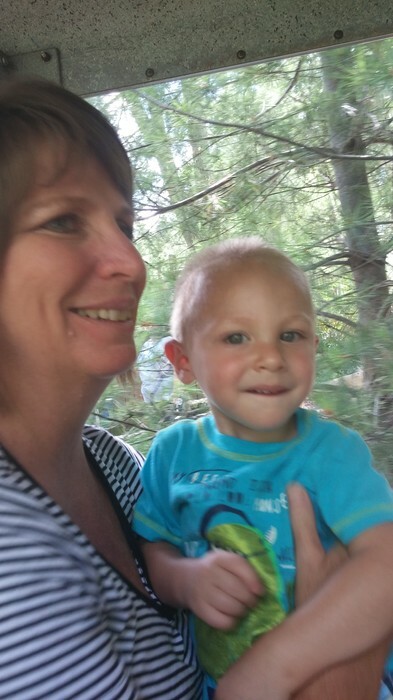 At two and a half, grandbaby Brady loves to go to the park, swing on swings, visit the zoo, and the Indy Children's Museum. Mrs. Selmeyer says she has learned a lot over three decades of raising children. She regrets that much of her time with her natural born children was spent being a teacher first. 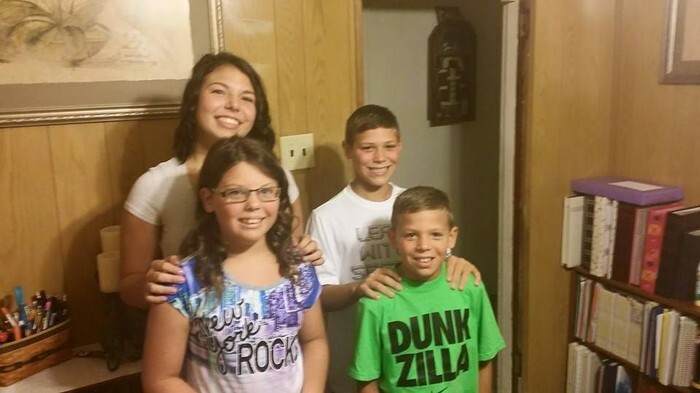 With her new children she says they do a lot more together as a family, balancing on one foot sometimes to do homework, sports schedules, and teaching. Brenda says that being a mom, grandma, and teacher has its benefits. 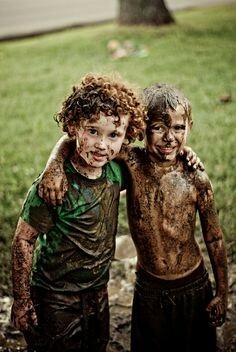 "There is never a dull moment, and I have a life full of people who bring me Joy!" Mrs. Wheat has been a PE teacher for SD for many years. 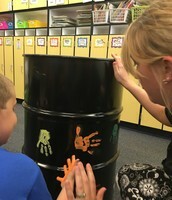 Last year was her first time working with elementary students. 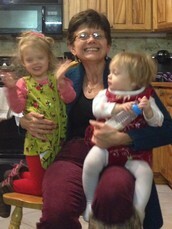 Having her first grandchild has really helped her have patience with younger children. Mrs. Wheat is in training nearly everyday as she babysits her two and a half year old grand son, Vance. Since Mrs. Wheat is a PE teacher, Vance has a heads up in sports training. 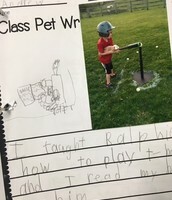 She loves to take him to the park, play baseball in the yard, and blow bubbles. Vance appears to love anything to do with the water and loves playing with trains, trucks, and cars. Mrs. Wheat says, "The most exciting thing that I have ever done with him is watching him walk toward me." 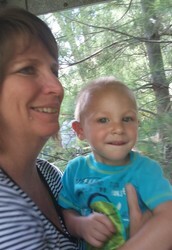 That is called GrandMOM LOVE! What face is on your phone? 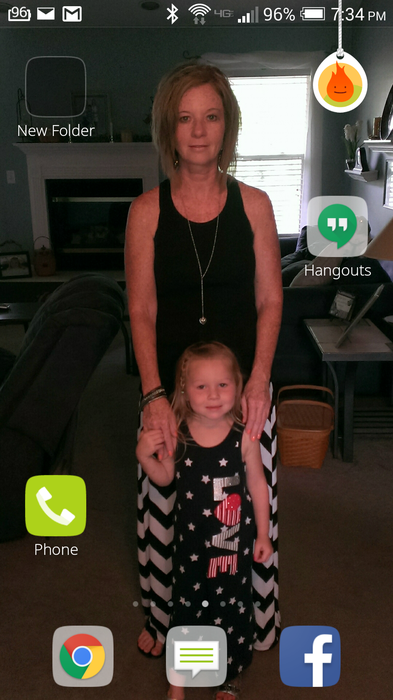 Ms. Lyttle has a favorite picture with her five year old grand daughter, Charlie. Ms. Lyttle has been a teacher at MES for 32 years, a mom for 29 years, and a grandmother for five. She was a fifth grade teacher for 12 years and a second grade teacher for 18 years. 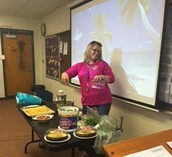 For the last two years she has been the art teacher for K-6th at three different South Dearborn Schools. 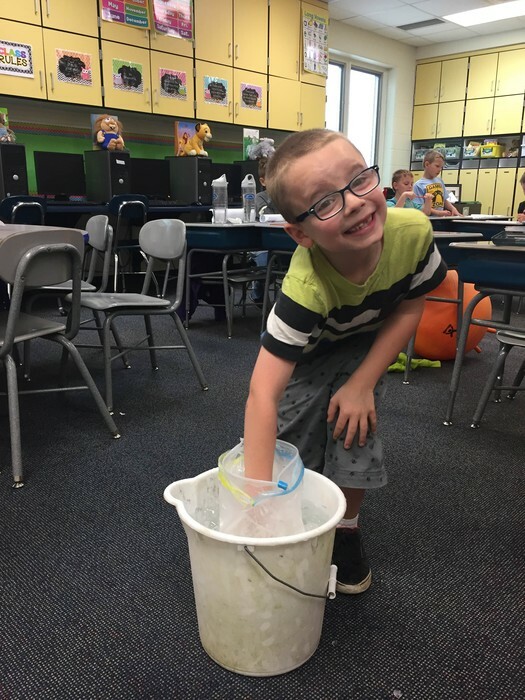 Nothing could have prepared her better for working with young children and how to lead them through detailed procedures in art, than working with her grandbaby, Charlie. Charlie loves to do anything and everything with her Nana. They go to the park, shop, eat out, and ride bikes. 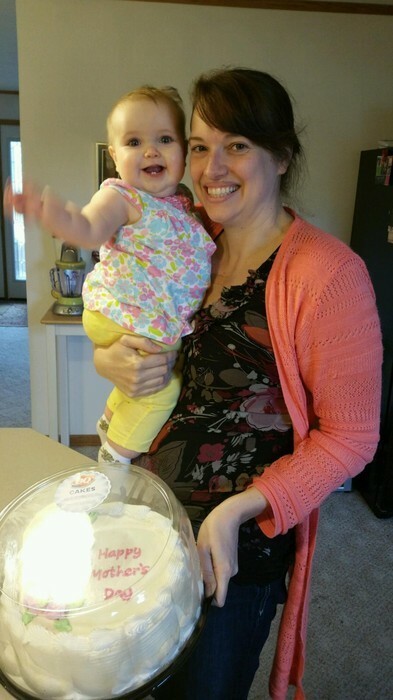 Ms. Lyttle says, "I have learned patience and caring for other's children through being a a mom and a teacher." For Mother's Day, and for my mom. And locked my love inside with a lock. She smiled with quite a shock. She loved it a bunch. She locked it up, and put it away. 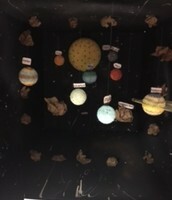 In a glass cabinet for everyday. Hidden behind that Mother’s Day lock. AT MES ALL TEACHERS FEEL APPRECIATED! "They are the nuts and the bolts of our school!" 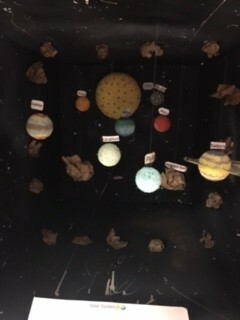 They are in every classroom. So we have a week celebrating them! Who are they? They are our teachers! 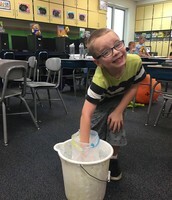 Throughout the first week in May, the Student Council under the guidance of Mrs. Peters and Mrs. Stoneking provided all kinds of tasty nuts, and they said that teachers are the nuts and bolts of the school. 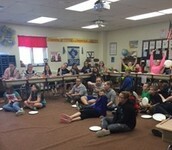 Another day, the student council brought breakfast that included: donuts, fruit, muffins, bagels, and coffee cake! 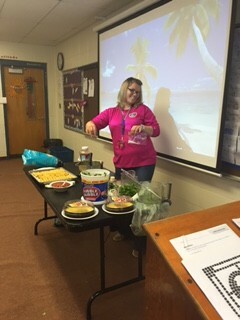 On Thursday, the PTO provided lunch from Chipotle. 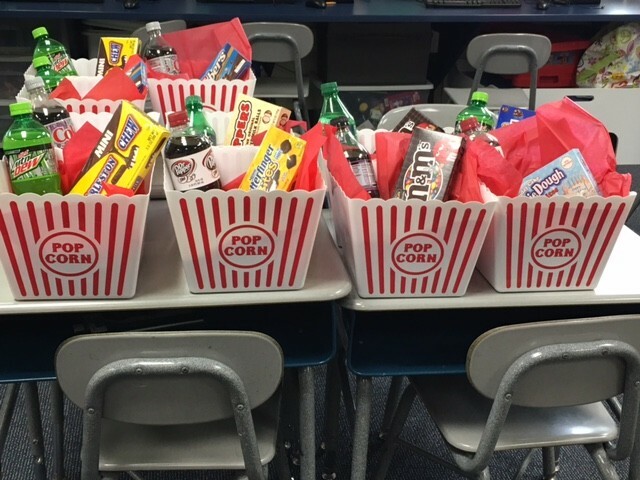 On Friday, the teachers were treated to a 10 minute massage and their favorite candy, drink, and popcorn, with a redbox coupon for a relaxing movie night! The teachers deserve something special every once in awhile, so when the teachers received their gifts they were in total and complete awe! 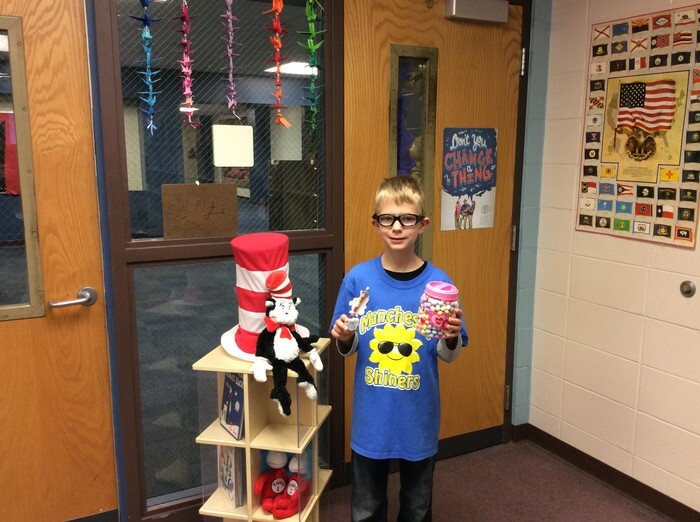 Dr. Seuss Week Was Fun! Dr. Suess Week was out of this world! Guest readers came to our school to read to us! Firemen, Policemen, and 6th graders from MES roamed the halls reading to classes. 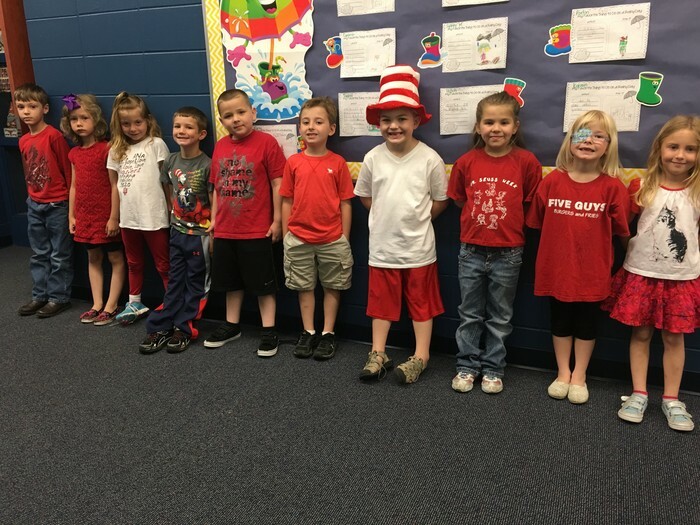 K-6 dressed in red and white like the Cat in the Hat, and grey to honor Horton. We also ate Elephant Ears and the line was all the way down past the office! It was crazy! 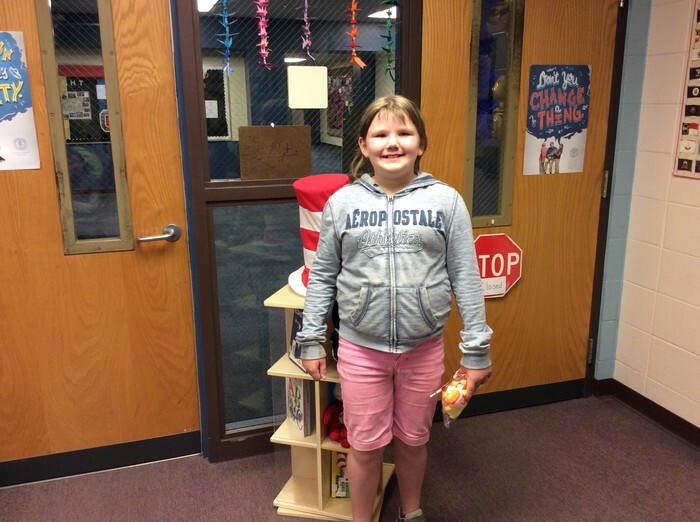 I hope we have Elephant Ears next Dr. Seuss Week! guessed 354 out of 356 eggs that Horton was sitting on in the library. 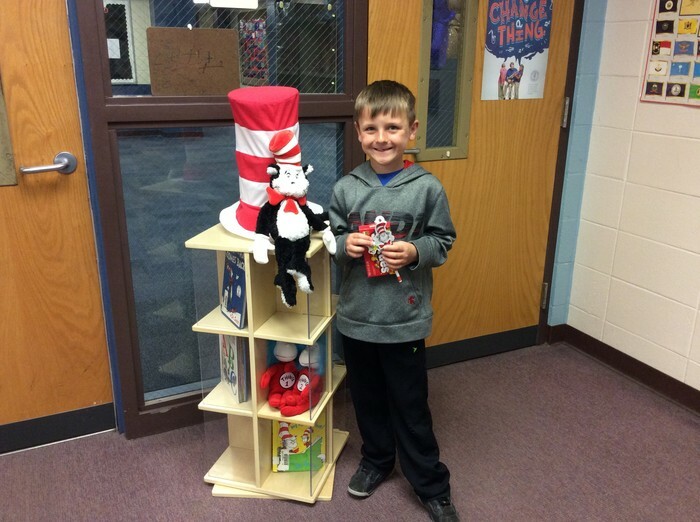 won for "Read Across America" on Red & White day. won for wearing gray on Horton's Day. 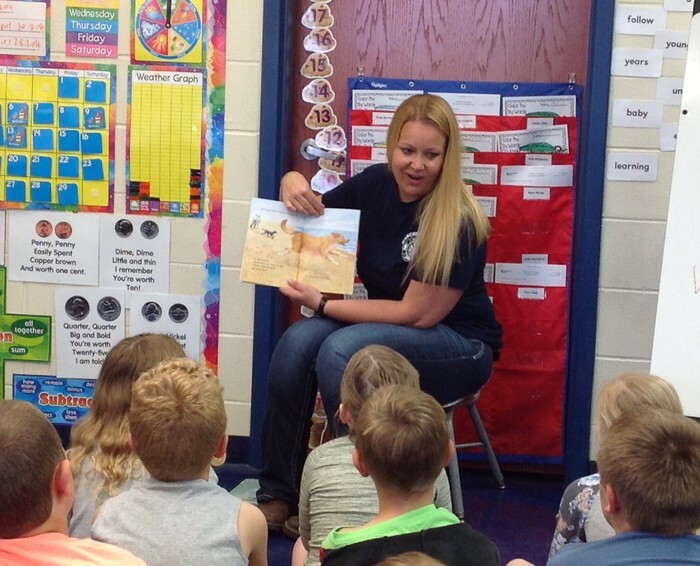 reads Big Bear, Little Bear to Mrs. Peters's 2nd graders. reads The Circus Ship by Chris VanDusen to Miss Weismiller's 1st grade class. 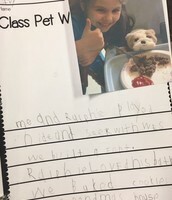 reads a true story about a dog named Brave Norman to Mrs. Stoneking's 1st grade class. All South Dearborn Students participated in a Bus Evacuation Drill in May to make sure your children know what to do in case of an emergency while on a school bus. Older mature children were instructed to help the others out the back of the bus. Then all went to a safe place at least 50 feet away from the buses. 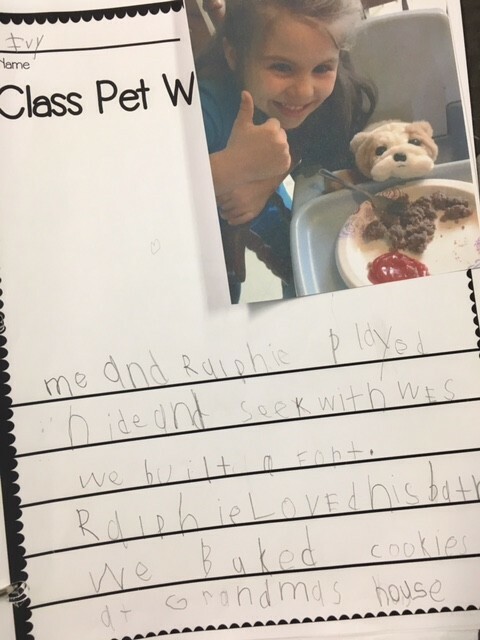 took Ralphie home and played hide and seek and baked cookies together. 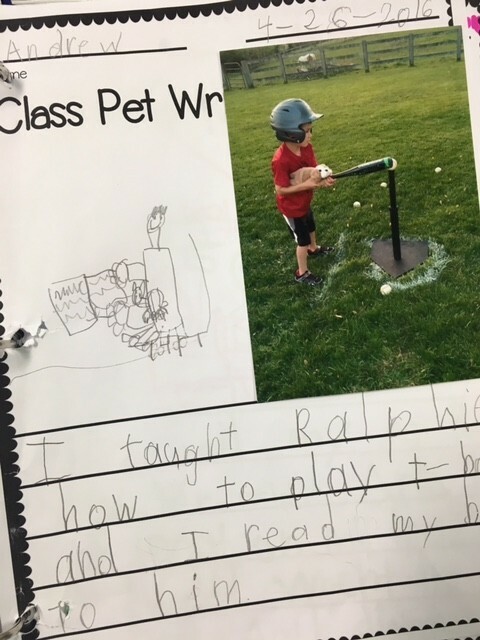 says he and Ralphie played T-ball together and read books. 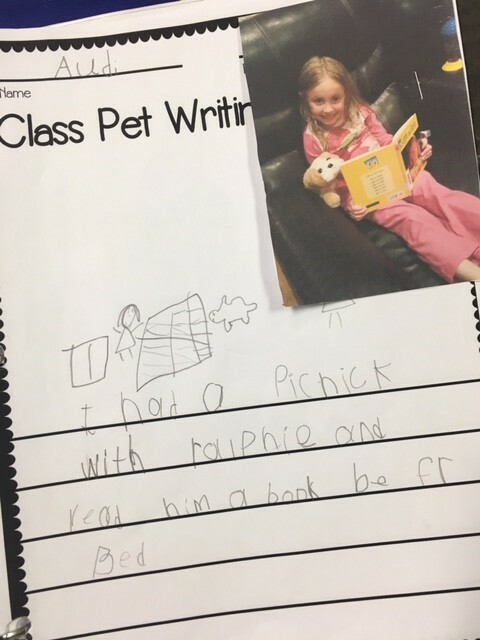 says that she and Ralphie had a picnic and read a book before bed. 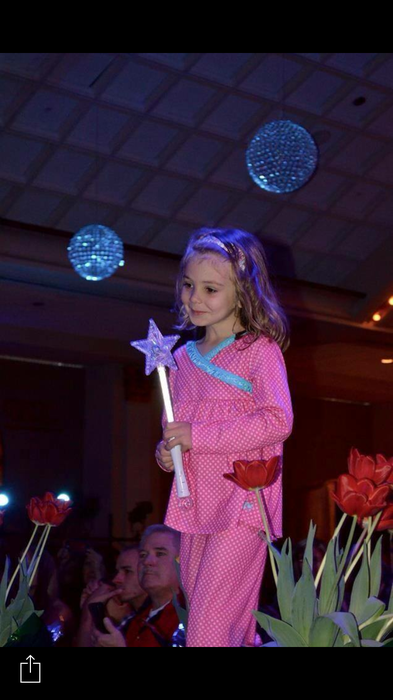 Kindergartner Baylee Buckhave took part in an American Girl Fashion Show to raise money for the Aubrie Rose Foundation. 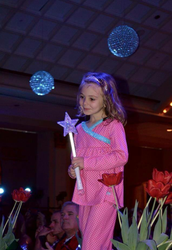 The Foundation seeks "to help families caring for children with life threatening illnesses." When asked why she did it, Bailey said, "I get to help sick kids who are just born." Thank you Baylee for being a good and caring citizen at such a young age! 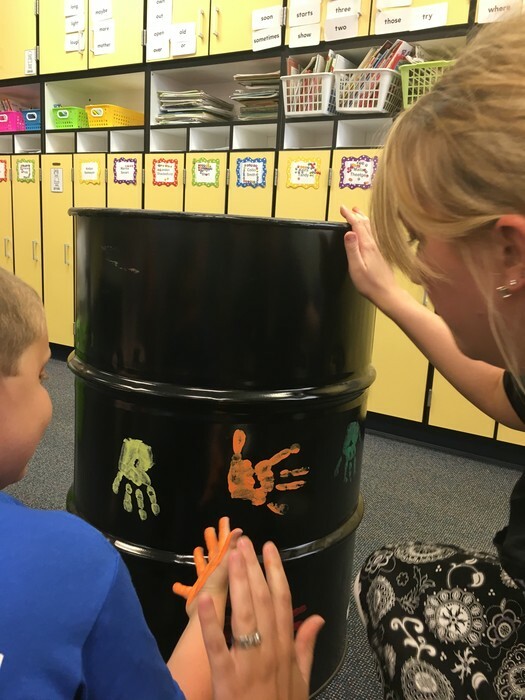 hand painted a recycling barrel with the theme "Save the Seas!" to be placed in the community of Manchester. won first place for creating the most artistic bookmark showing where books will take you in Indiana. 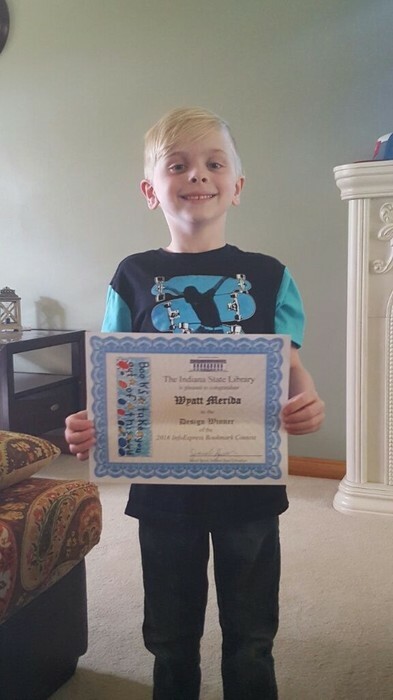 His bookmark will be printed for our school and libraries throughout Indiana, and our school wins a free year of INFO EXPRESS. 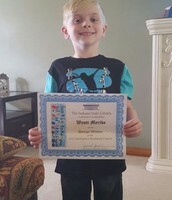 Great Job Wyatt! 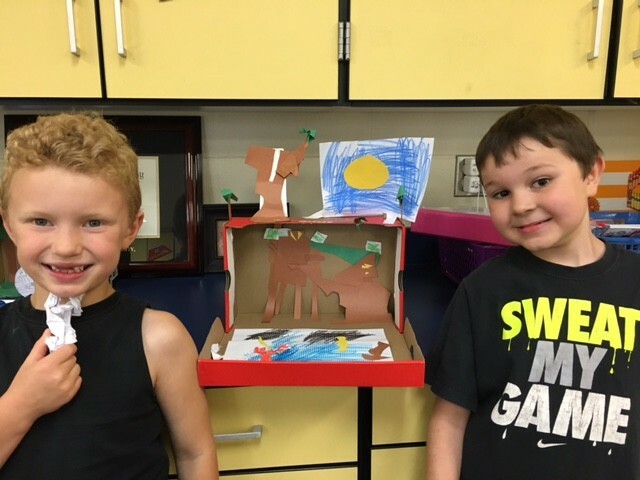 go to Where The Wild Things Are in a shoe box for Mrs. Houchens RTI Project. 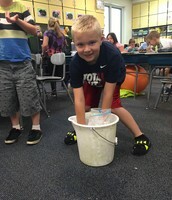 Weismiller's 1st Graders Make Blubber! 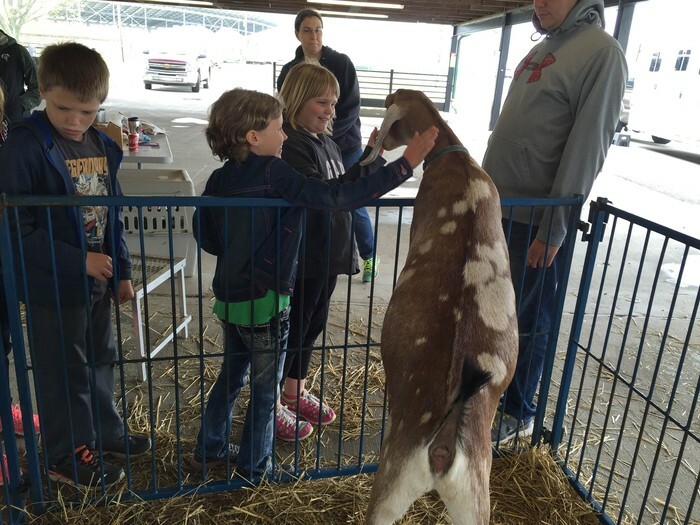 First Graders got to experience first hand how animals keep warm. As you know, some animals have a fat layer, or blubber, all over their body to insulate them from the cold. 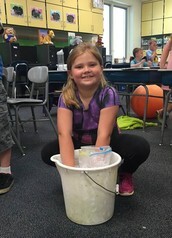 Miss Weismiller had her students make blubber out of vegetable shortening and water. 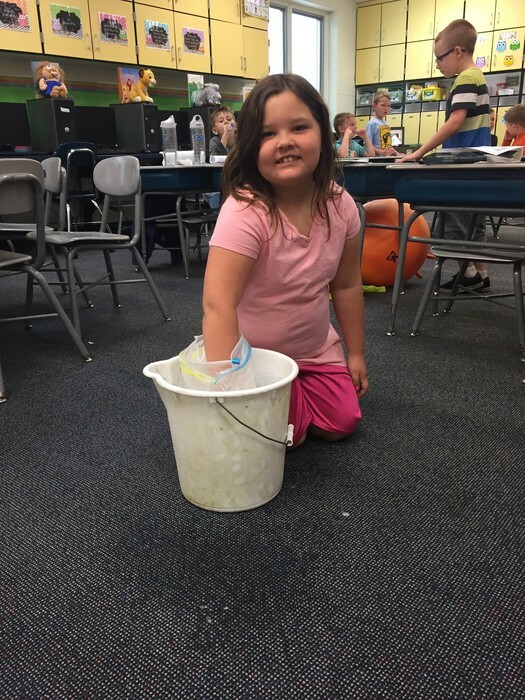 Danica Neff says, "We were reading a story about whales and we didn't know what blubber is like. 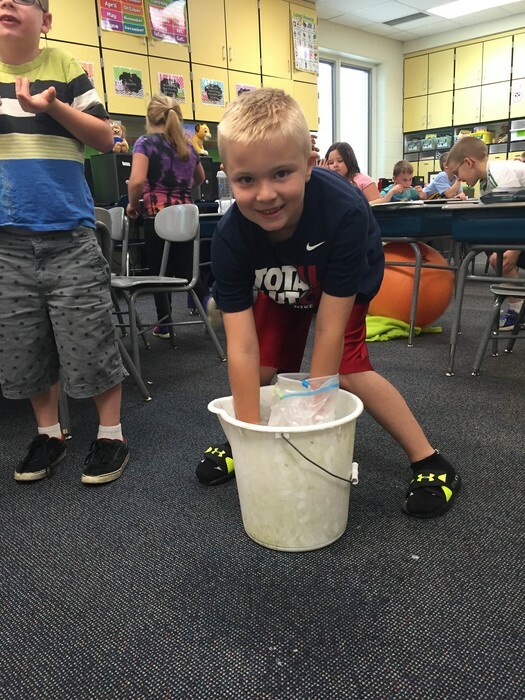 So Miss Weismiller made some so we could feel what it's like for whales to go in icey cold water." 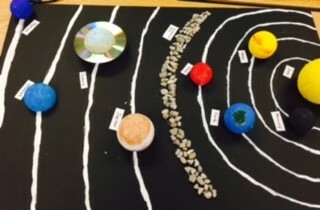 Learning can be such FUN! says, "Feeling blubber was like putting my hand in a swimming pool in the summer. 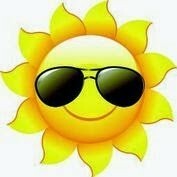 It was nice and warm." says, " Feeling blubber was kind of wierd. 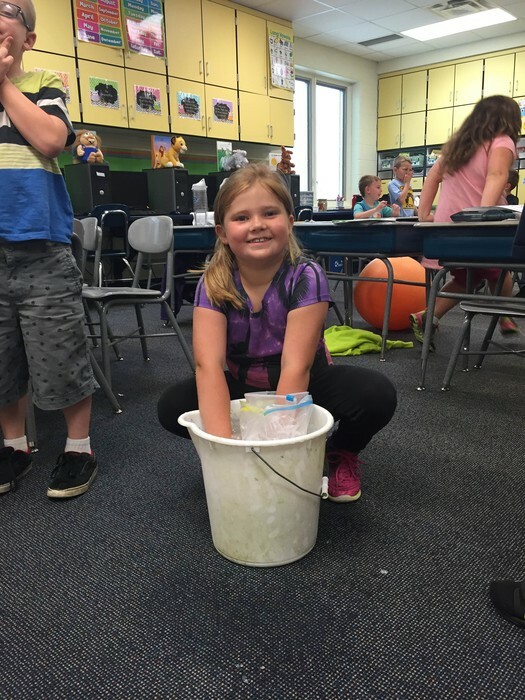 When my hand was in the blubber, I could't feel the ice cold water." says, "It was really warm in icey cold water. We were on Amazing Animals and did you know polar bears and whales have blubber?" 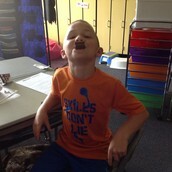 Mrs. Macke's 2nd grade class won an ice cream party on May 6th for collecting the most box tops - over 900! 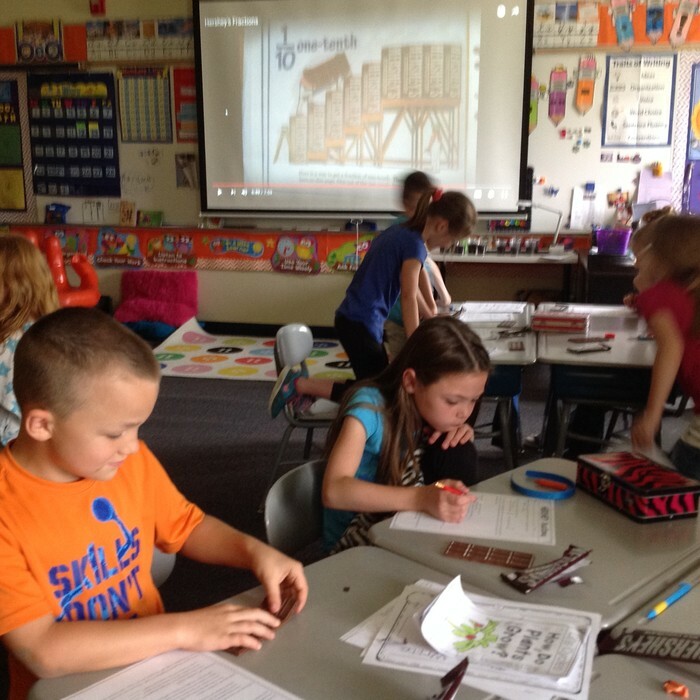 Box Tops earn the school purchasing power to buy necessary tools for our classrooms. Each one is basically worth a dime, so 900 means $90 worth of buying power! 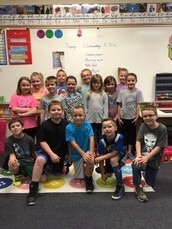 Good job 2nd grade! 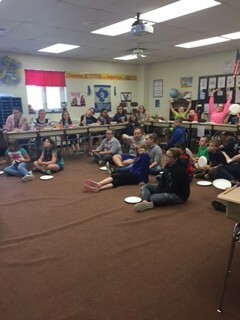 Altogether the whole school brought in 17,000 boxtops this school year, earning MES a $1700 check! Just like you would not throw away a dime, don't throw away a boxtop 'cause every little bit counts! through a video showing the fractional parts of a candy bar. answers questions about his sweet fractions. 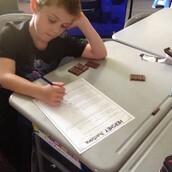 ate his chocolate bar one sweet fraction at a time. 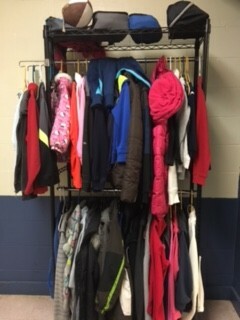 What is always a cold damp day for MES students? 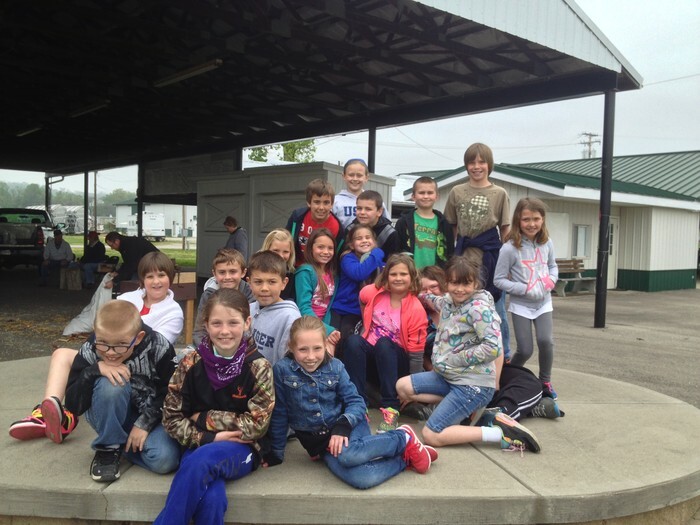 The third grade field trip to AG DAY at the Lawrenceburg Fairgrounds has been cold and wet almost every year. 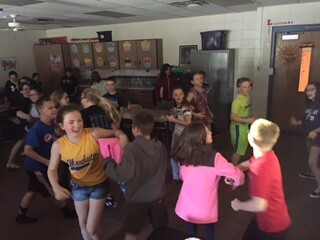 However, the third graders all enjoy it. They get a chance to learn about farm animals, food production, making apple cider, using farm tools old and new, and composting for better gardens. Kylie Cahill said, "It was fun. I liked petting the chickens!" Now you can't do that everyday! puts her back into it to saw a log like a pioneer. give attention to a goat and get a thrill in return. smells the good green earth of organically grown plants. has fun creating a Mexican feast. dance to a Mexican Hat dance. learn while they feast on Miss Warren's good cooking. Open For Boys and Girls 4 years old to 8th grade! Sign up: Last Day is Saturday, May 21st from 9 am to 12 pm. Fall Price: $60 a player / $40 Lollies / $150 Max. Don't Miss Awards Day May 26th! On Thursday, May 26th at 9:30 in the morning, MES invites all parents to come see the students receive various awards for the 2015-16 school year. Guardians will be able to sign out their child in the students' classrooms following the presentations. 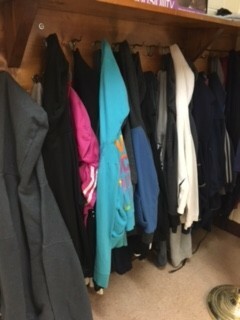 PLEASE CHECK OUR LOST AND FOUND FOR YOUR STUFF Before the End of the Year! Thanks to all of the “moms” out there for everything you do to support our students, staff, and school. We are so blessed to live in such a caring and nurturing community. I’ve seen you all rally around folks who are in need time and time again. 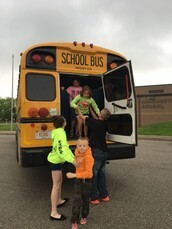 It’s hard to believe that we are coming to the end of another school year. Thanks to all of our teachers, staff, volunteers, and families for making a difference in the lives of our children. The last few weeks of school are always very busy and it’s important for students to continue to put forth their best effort. Mrs. 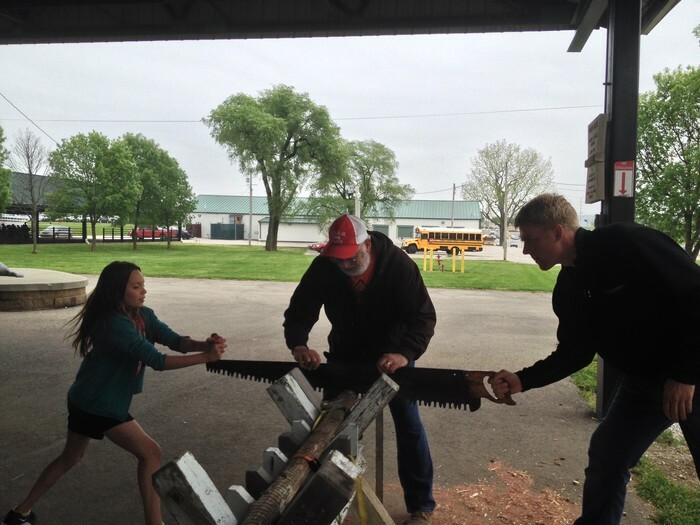 Wheat and the PTO officers have been busy planning lots of fun activities for our students on “PTO Fun Day” which will be held on May 25th. Our last student day is May 26th with the awards program starting at 9:30. 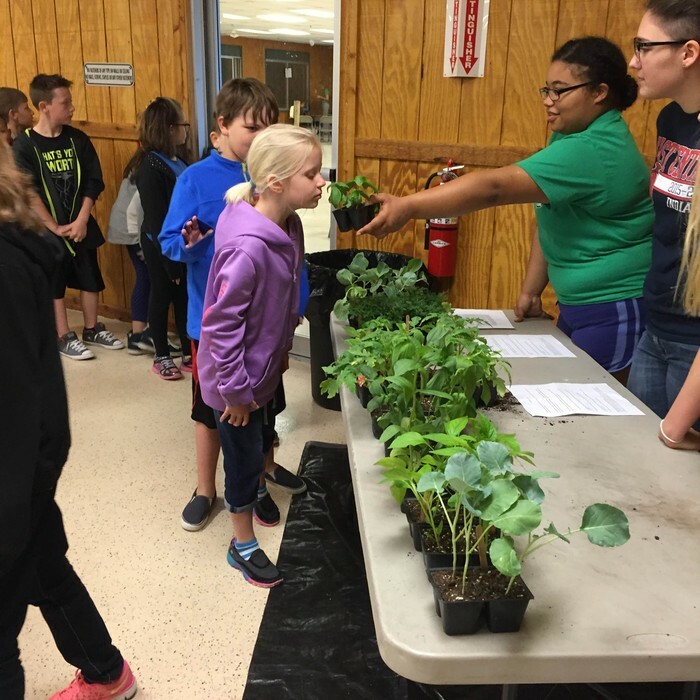 Students will receive their final report card on the last day of school. SDCSC will be conducting online registration for the 2016-2017 school year. Please make sure your email and telephone information are updated before we begin summer vacation.